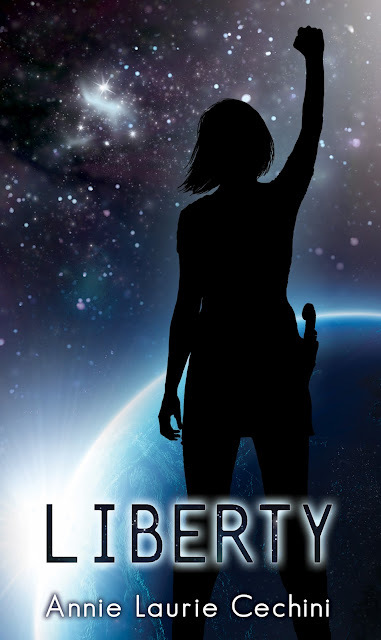 Today, the cover for Annie Laurie Cechini's Liberty is being released, and I thought I'd share it with you. It's coming out in February from Rhemalda (from the people who pubbed Witch Song). Personally, I find the cover a little bland, though I like what they were going for and I the synopsis intrigues me. When young space captain Tabitha Dixon loses her ship and her crew, she is forced to accept the help of a young shipbuilder who runs communication for the Resistance. As the pair track down the captain's missing crew, a bond begins to grow between them. However, that bond, along with everything Dix yearns for, is threatened by her belief that she's destined to kill anyone who gets close enough to touch. O I love love love it. I think outer space is getting to be a trend. You're right, though, a little bland. I think if they do something a little more showy with the font and add texture to the physical cover it could be pretty stunning.